Tom's Hardware dug up details about Lynx Point, the new chipset that will accompany Intel's Haswell architecture in the first half of 2013, probably around March to June. Full details over here. First, we see some of the display port features have been transferred over to the CPU under the new architecture for Haswell. As discussed here, the Lynx Point chipset will only handle analog displays, while the CPU will be handling the digital displays. In theory, this makes the Lynx Point not as advanced as Panther Point in that regard but it does still have its advancements. Lynx Point marks Intel's switch to full SATA 6.0 Gb/s support for all native SATA ports (no more native SATA 3.0 Gb/s SATA ports). Intel has added two additional USB 3.0 ports for a total six ports, which is two more than Panther Point. 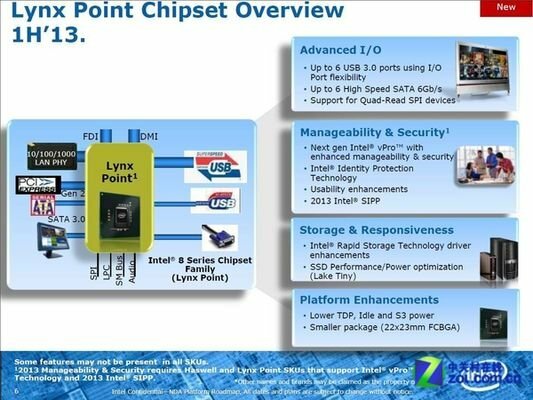 Intel is introducing I/O port flexibility feature with Lynx Point. As the feature suggests, it should give users the ability to allocate which ports are USB 3.0 and which are USB 2.0. Additional features for Lynx Point include: SSD performance/power optimization, new Rapid Storage Technology driver & Intel vPro Technology enhancements, lower TDP and power usage, a smaller package (22x23mm FCBGA), and support for quad-read SPI devices. Based on the slide, it looks like Intel has still not moved to a faster DMI interface, as the chipset's PCIe ports are still running at PCIe 2.0.